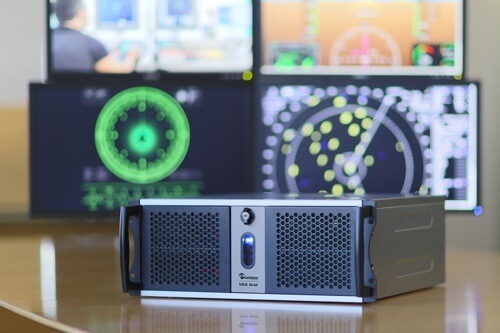 The ever growing number of control rooms in industrial and military applications presents new opportunities as well as challenges for AV integrators. The abundance of monitors, cameras, mounts, switching equipment, etc. brings a significant opportunity for contractors to add value during the sales, installation, and support phases. However, without careful selection of high quality system components, maintenance can be a nightmare. When Steve Mills, CTS-D, of Corbett Technology Solutions Inc (CTSI) was tasked with looking for a solution to record and stream multiple video sources from a military drone operations control room, he needed reliable, high quality gear. The installation involved capturing displays from three military drone operators with up to two analog or digital screens each. The operators’ on-screen actions needed to be recorded and streamed offsite for immediate review by other parties. Additionally an over-head Sony EVID70 camera and Audio Technica ES961 microphone was used to keep a record the operational flow and chatter in the control room. Tight space requirements meant the whole system, including the recording and streaming device had to fit in a small portable rack unit. “The Epiphan Grid is a perfect product to capture the multiple input images, synchronized together so they can be played back in a multiple-screen layout or reviewed one image at a time.” After looking at multiple products, CTSI chose VGA Grid from Epiphan Systems as the central hub for recording and streaming the audio/video content. “We reviewed other options, but many were either 6-10 times the price or limited in recording, or streaming capabilities,” says Steve Mills. “The Epiphan Grid is a perfect product to capture the multiple input images, synchronized together so they can be played back in a multiple-screen layout or reviewed one image at a time.” Synchronized recording is accomplished with VGA Grid’s multi-track recorder that records multiple streams to a single multi-track file. Multi-track file recorders can be configured to contain any number of the encoded streams and the SD camera and microphone. With its ability to simultaneously and synchronously capture, record, and stream up to six HD video sources with resolutions up to 2048×2048, as well as six SD video sources and six audio sources, VGA Grid turned was the perfect solution for the control room (military drone operations) installation. To fit in a small footprint, an off-the-shelf Dell tablet was used as the control panel of the VGA Grid. The 4U rack-mounted VGA Grid unit is small enough to mount in a ruggedized rack and still have enough space for a custom connector panel with storage space for the camera, tripod, microphone, and Dell control touch panel. VGA Grid is ideal for solutions requiring capture, recording and streaming of multiple HD inputs. It has two product variants that cover a wide range of applications with one supporting six 2k inputs and another up to 64 networked HD inputs. It simultaneously streams and records video synchronized from all inputs. Automatic stream configuration get things running quickly, and the ability to fine tune control of the encoding process lets system integrators customize this solution to the exact specifications of the problem at hand. Unicast streaming is supported for up to 100 simultaneous users. Or, for larger audiences, multicast streaming and CDN integration via RTMP and RTSP are supported. Recordings can be automatically transferred to accessible file storage locations, enabling 24/7/365 recording.